In 2012, Cathy Barnes-Miller created the Miamisburg Adaptive Color Guard for special needs students: the first of its kind in Ohio. The guard was developed to help people with special needs work on motor skills, listening skills, and relationships with their peers. Cathy also hoped to raise the public's awareness of these students and their capabilities and needs. 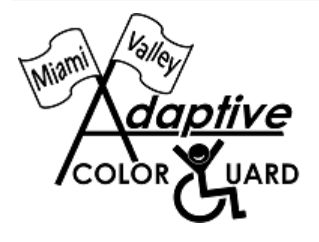 Shortly after being formed, membership was open to students throughout the region becoming the Miami Valley Adaptive Color Guard. During the fall season, the Miami Valley Adaptive Color Guard will perform at local football games, however it is the winter season where these performers really shine. MVACG performs at local circuit competitions and at WGI world championships!